..:: The Portfolio of D. Graham Stinson ::.. The owner of our company gave us two directives: one, he wanted the site to encompass the entirety of our company's activities; two, he wanted it to be a virtual environment. Together with my brilliant staff designer, Nate Manny (www.halftonedesign.com) we developed and produced plans for an amazing concert venue / art gallery / coffee shop, up to and including the badass Airstream-style coffee trailer embedded in the wall. We packed up the plans along with brand guidelines (in the form of a collection of images, fonts, etc.) and sent them to our web house, who executed our vision. See also the Storyville Brand project, below. 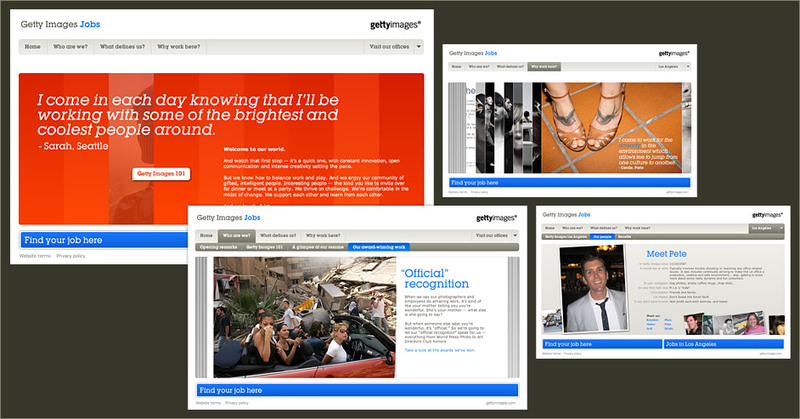 I served as Art Director, giving direction and input to Wiretree, the design and development team in Atlanta, GA.
Getty Images underwent a massive rebranding effort over the past year - and as a result needed to bring their corporate sites in line with their new brand. I worked extensively with the HR department and the Creative Services division to concept and develop their new Jobs site. We chose to concentrate on the spirit of working at Getty Images from the point of view of the employees more than the official corporate spiel... so the language is friendly and honest, the quotes are from actual employees, and the gives the user the ability to see into what it's really like to work at Getty Images. The site launched in February 2008, and the response, both internally and externally, has been fantastic. Art Director, Information Architect, Designer. Everything but code. PowerAde has been a sponsor of the NHRA for a few years now. 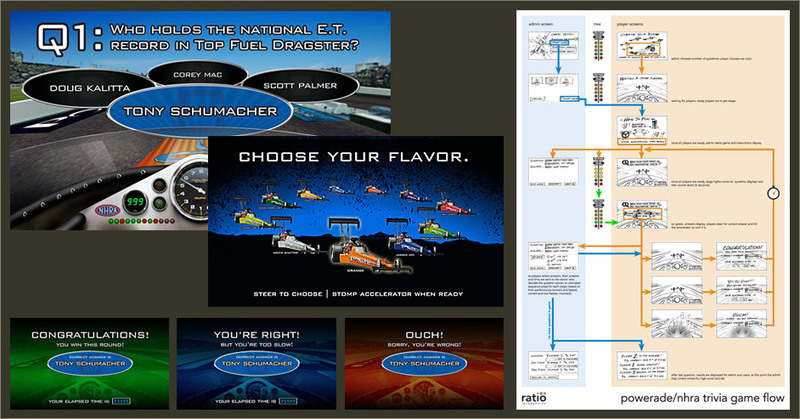 In order to add a focused marketing push to their introduction of a couple new flavors, Ratio Interactive helped to concoct an NHRA trivia game played in a racecar cockpit and complete with a set of 'Christmas Trees' (the multi-light display that starts drag races). We networked four PCs with the Christmas Trees and the control interfaces (steering wheels and pedals) for a head-to-head experience and devised the gameplay and graphics - all the way down to PowerAde flavor-themed dragsters. Shown here are a few screens from the game plus a flow diagram showing interaction between the main server, the Christmas Tree and the player computers. Art Director, Illustrator, Designer. Everything but code. Art Director, Designer; also developed proof-of-concept prototypes in Flash. 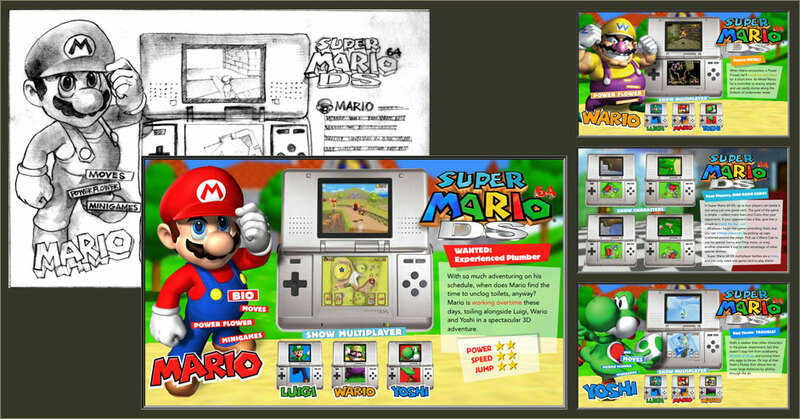 As a flagship release for the long-awaited Nintendo DS, the Super Mario site needed to familiarize users with the platform as well as the product. The site uses a lot of in-game video (including a synchronized four-up matrix) to show how the DS reworks this classic Mario title and allows friends to play with and against each other. Art Director, Designer. Everything but code. 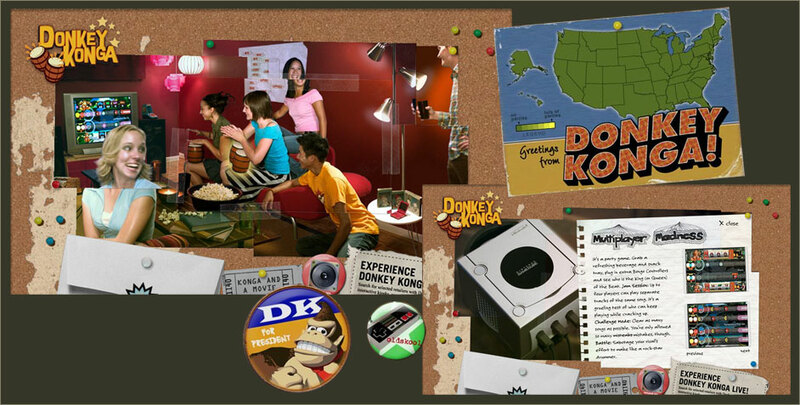 Donkey Konga was the first Nintendo release to use the DK Bongos controller - it's a music game in the spirit of Dance Dance Revolution, and is a killer party game. 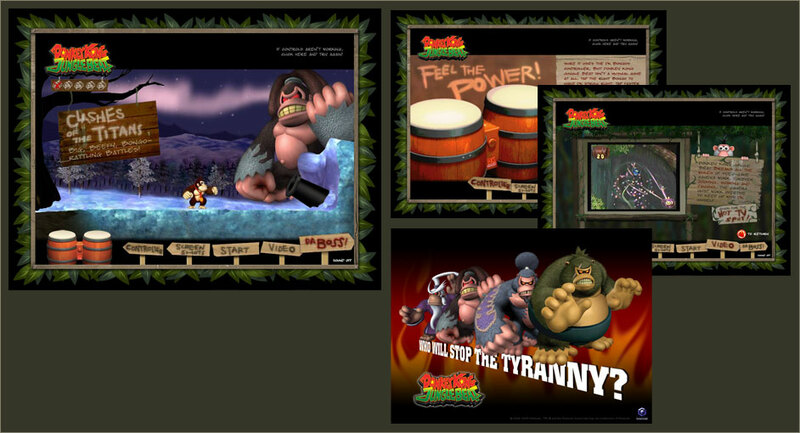 Instead of doing the typical game simulation site, we decided to make the site a resource for throwing a Donkey Konga party. The site (set on a bulletin board) includes recipes, invitations, a competition bracket generator and information on upcoming DK releases. Art Director, Designer (with Nate Young); also developed proof-of-concept prototypes in Flash. A coffee company that dictates that its coffee should be drunk within 12 days of roasting is setting themselves up as either complete whackos or experts in their field. In any case, their passion needs to come across in their packaging and their presentation. I developed this packaging and imagery to be both revolutionary and cost-effective. Various designs for various projects. Included here are logos for a web award site, various small businesses, an industrial design firm, a content management system, a church planting network, and a Seattle Monorail (gasp!) task force. Deeper Down is Anthony Skinner's first mainstream release as a premier artist for Sonic Temple Records. For Sonic Temple's releases we designed the packaging as a hybrid coffee-table-book-meets-dual-disc setup (conceived by Nate Manny) which allows for very high-end publication including a 28-page interior booklet. This project was intense, and included flying to Nashville to art direct a photo shoot with excellent photographer Jeremy Cowart, then conceiving and designing 28, 8" x 8" pages of story arc for the album. Art Director, Designer. Assisted by Nate Manny. Brian Judah is a young LA based singer/songwriter who spent the last several years honing his storytelling by exploring his late mom's battle with breast cancer. This was an early design. DC3 Entertainment staged a series of 'Discovery Music' concerts at a small repertory theater in Ferndale, CA from mid 2005 to mid 2006. The key to the concerts was that the performer (a first-rate performer who had not achieved personal mainstream success) was not introduced until they took the stage - in other words, people would buy tickets and sell out the performances without ever knowing who was going to be playing. What's more, all the proceeds from ticket sales was donated directly to community charity groups.The series was a huge success, and spawned a roadshow renamed 'Sonic Temple Live'. A few corporate portraits, and a poster series for a design book. A set of portraits for a company trading card game, and a company Christmas card. At left, a large-format folding insert for a CD release; at right, a cover illustration made up of several old and new photographs. Copyright 2008 Suspended Reality. All rights reserved.